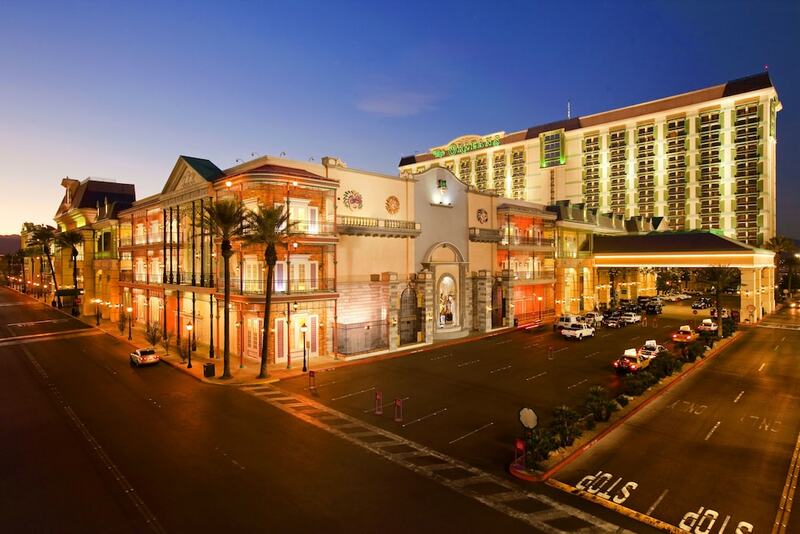 With a stay at The Orleans Hotel & Casino in Las Vegas, you'll be a 1-minute drive from Orleans Arena and 7 minutes from MGM Grand Casino. This casino resort is 1.8 mi (2.8 km) from Park Theater and 2.5 mi (4 km) from T-Mobile Arena. The 3-tower Orleans Hotel and Casino hosts a wealth of facilities, including two pools, an oversized spa tub, The Spa Orleans health spa offering massages, aromatherapy and beauty treatments, a sauna and steam rooms (surcharges), a business center (surcharge), and a fitness center (cost included in resort fee). Other amenities include nightly entertainment, myriad restaurants and bars, wireless Internet access, and 24-hour room service. The 142,000-square-foot casino offers plenty of gaming for adults, and children ages 3–9 may play in a childcare center equipped with a jungle gym, movie room, and a video- and interactive-game arcade (surcharges and immunization records required for use; open Sunday-Thursday, 10 AM - 10 PM and Friday-Saturday, 10 AM - 12 AM. Hours subject to change). Valet parking is complimentary (gratuity not included). This hotel offers a complimentary shuttle service to its companion hotel, the Gold Coast, and to Bill's Gamblin Hall. Big Al's Oyster Bar - Enjoy a Creole/Cajun-inspired menu of freshly shucked oysters, steamed clams, mussels, bouillabaisse, and pasta dishes. Open daily from late morning to late evening. Brendan's Irish Pub - This pub has a large bar of dark woods, multiple plasma-screen TVs, and live music nightly. It serves pub fare, Irish and British ales and beers, and Irish whiskeys. Open from mid-morning to late evening. French Market Buffet - Cooking stations include barbecue, Mongolian, Chinese, American, and Mexican. Specialties include seafood on Mondays, steak on Wednesdays. Breakfast, lunch, dinner, and Sunday brunch buffets are served daily. T.G.I. Friday's - This restaurant offers casual dining, eclectic menu, and happy hours. Open daily from late morning to late evening. Courtyard Café - This coffee shop has New Orleans-style specialties and Chinese fare. Open daily 24 hours. Java Vegas Coffee - Freshly brewed coffees, including unique espresso creations, are available at this popular new coffee shop. Rocky Mountain Chocolate - Head here for rich chocolate candy temptations. Baskin-Robbins - Ice cream treats are served in the Orleans Food Court. Fuddruckers - A wide variety of specialty and classic burgers are grilled to order, and salads, milkshakes, and lots more are served 24 hours a day in the Orleans Food Court. Subway - Sandwiches and salads are served 24 hours a day. Casino bars - 4 bars are located on the casino floor and open 24 hours. The poolside bar is open seasonally. The Prime Rib Loft - Overlooking the casino, this restaurant serves 4 styles of aged prime rib as well as chicken, seafood, and pasta dishes for dinner. Open evenings daily. Alder & Birch - this restaurant highlights American Tradition with hand-crafted cocktails, house made ginger beers, prime steaks, and classic American entrees. Ondori Asian Kitchen - features authentic Chinese entrees alongside a large selection of sushi dishes and Japanese cuisine. Entertainers such as Glen Campbell, Neil Sedaka, Donny Osmond, and Sinbad appear in the 827-seat Orleans Showroom. Home to the ECHL's Las Vegas Wranglers professional hockey team and the AFL's Las Vegas Gladiators football team, the 9,000-seat Orleans Arena also hosts major touring concerts, rodeos, ice shows, family shows, trade and consumer shows, plus a variety of motor sports. Live entertainment occurs nightly in the 140-seat Bourbon Street Cabaret. Nightly music, along with more than a dozen Irish and British brews on tap, please visitors of Brendan's Irish Pub. The enormous, 142,000-square-foot casino offers more than 3,000 slots, video poker, and video keno machines, as well as blackjack, craps, roulette, Pai Gow poker, and a 170-seat race and sports book. Other gaming options include a 23-table poker room and a 24-hour, 60-seat keno lounge. Club Coast, Coast Casinos' Slot Club offers complimentary membership cards that consolidate in single accounts slot and table play at four Las Vegas casinos (the Orleans, Suncoast, and Gold Coast). Members earn cash and/or comp rewards redeemable for cash, comps, event tickets, restaurants, and merchandise. Recreational amenities at the Orleans Hotel and Casino include two outdoor pools, a large spa tub, and a fitness center (cost included in resort fee). The Spa Orleans offers body wraps, massages, facials, and signature treatments in private massage rooms (surcharges). The spa also houses sauna and steam rooms (surcharges). On the resort's second floor are a 70-lane bowling center and an 18-screen theater that includes loveseat and rocking-chair seating (surcharges). Skydiving and helicopter tours are popular with Las Vegas visitors. Numerous golf courses are available in the Las Vegas area. Reservations are required for massage services and spa treatments. Reservations can be made by contacting the resort prior to arrival, using the contact information on the booking confirmation. Free in-room WiFi has a 3-device limit.